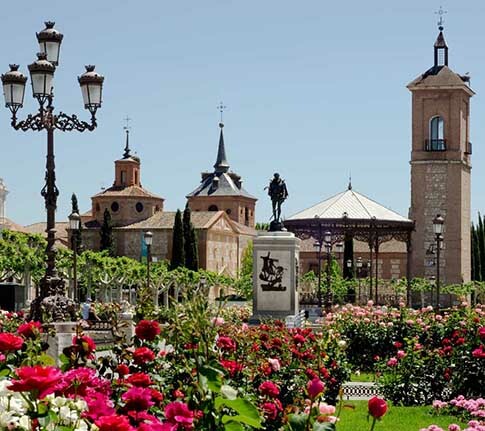 Alcalá de Henares, one of the most important cities in the history of Spain, is just 30km from Madrid. 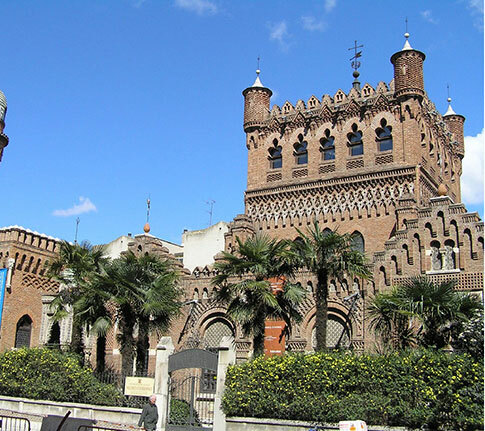 The Complutense University was founded here in 1499, and since then it has declared Spanish a language of culture. 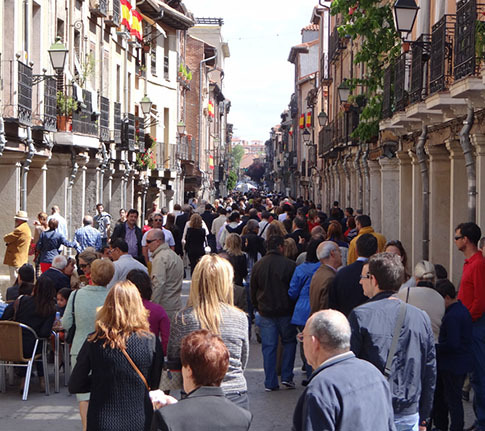 As a result, Alcalá de Henares is now part of the “Path of the Spanish Language“, a route comprising all those places in Spain that have had a special influence on the Spanish language. In 1998, it was classified as a World Heritage Site. Rodrigo Gil de Hontañon, the architect behind the Salamanca and Segovia cathedrals, started building this hall of residence in 1537 in the Mudejar style. 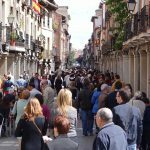 Its construction was finished in 1553 under the quantity surveyor, Pedro de la Cotera. It boasts an elegant plateresque façade with interesting grilles. 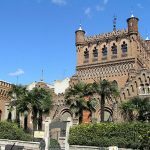 Inside, you can still see two of the Colegio Mayor’s three original cloistered yards: the Patio de Santo Tomás and the Patio Trilingüe. 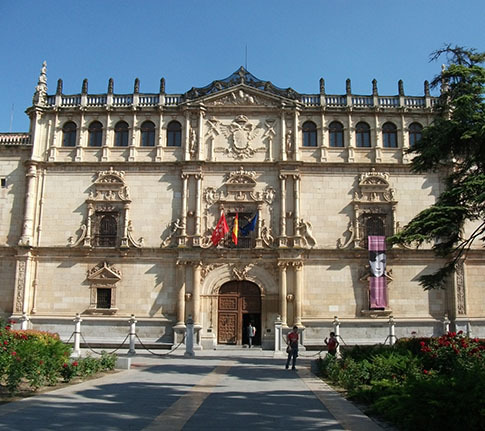 Inside this building lies the Alcalá de Henares University Auditorium, where prize-giving ceremonies and important academic acts were held – and where the Cervantes Prize, the highest recognition of Hispanic Arts, is awarded on 23rd April each year and the San Ildefonso Chapel, where leading figures associated with the university are buried, such as Pedro de Gumiel, Antonio de Nebrija or Cisneros himself. The cardinal’s resting place is a renaissance-style Carrara marble tomb bearing a design by Domenico Fancelli, with engravings of military themes, intellectual and religious life. The plaster work boasting Gothic, Mudejar and Renaissance motifs and the coloured plaster lattice work create an extremely beautiful place. They say it was erected on the spot where the Santos Niños Justo and Pastor were buried. These holy children, whose saint’s day is celebrated on 6th August, are now the patron saints of the city, and their relics are kept in the crypt below. The cathedral is one of the only two churches in the world called “Magistral”, meaning that all its canons are “magisters” or lecturers at the university. In 1956, work was carried out to restore the home of Miguel de Cervantes, author of Don Quixote, who was born back in 1547. The aim was to make it look just like it had done in the 16th century, adding painting collections, artefacts and decorative elements from that time. 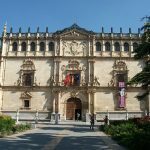 Located in the Madre de Dios Dominican Convent, a building constructed between the 17th and 18thcenturies, this museum brings together archaeological remains found in the Autonomous Region of Madrid. 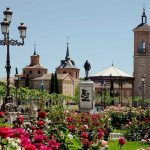 Beautiful historic city, 35min from Madrid in Car (A2), or take the train (Cercania) at Atocha o Principe PIO, line C2 or C7 to Alcala de Henares. Shopping is funny there, like historic shops dating back 100 years ago! And some tourist shops of course.